Remember Sleepless in Seattle, the 1993 romantic comedy starring Tom Hanks and Meg Ryan? Well, there should be a remake of that film entitled Clueless in Washington. But it wouldn’t be romantic and it wouldn’t be a comedy. Though there would be a laughable aspect to this film, because it would be about an editorial writer at the Washington Post trying to convince people to feel sorry for the IRS. Here’s some of what Stephen Stromberg wrote on Wednesday. Congress has done some dumb things. One of the dumbest is the GOP’s penny-wise-pound-foolish campaign to defund the Internal Revenue Service. …its mindless tantrum against the IRS has produced for taxpayers: a tax season that was “by far the worst in memory,” according to the Taxpayer Advocate Service, an agency watchdog. Before I share any more of the article, I should point out that the “Taxpayer Advocate Service” isn’t a watchdog. It should be renamed the “Government Advocate Service” since its main goal is to increase the IRS’s budget. But I’m digressing. Let’s continue with Mr. Stromberg’s love letter to tax collectors. The underlying problem is that Congress has asked the IRS to do a lot more, such as administering a critical piece of Obamacare, but the GOP Congress won’t give the agency the funding it needs to do its work. …But good luck convincing Republicans to fix the IRS’s entirely predictable and avoidable problems. Not when that would mean restraining the impulse to act on anti-tax orthodoxy, blind populist anger and scandal-mongering about the IRS mistreating conservatives. In fact, Republicans want to double down on their nonsense budgeting, proposing deep cuts to the IRS last month. Oops, time for another correction. 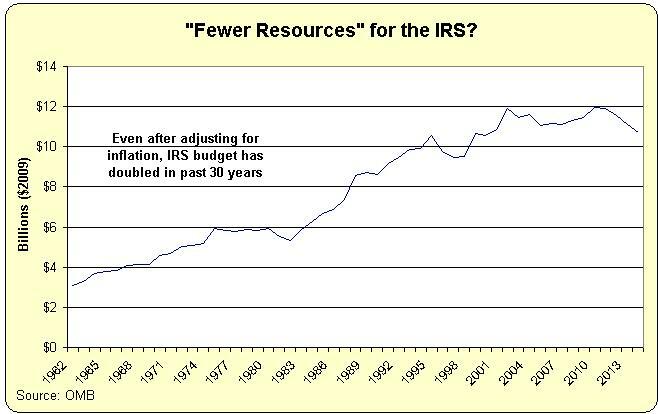 Stromberg is cherry picking data to imply that the IRS budget has been savaged. If you look at the long-run data, however, you’ll see that the IRS now has almost twice as much money to run its operations as it did a few decades ago. And that’s based on inflation-adjusted dollars, so we have a very fair apples-to-apples comparison. Stromberg also wants us to sympathize with the bureaucrats because the tax code has been made more complex. The underlying irrationality is the same: The IRS doesn’t write the tax code or health-care law, but the agency must apply these policies and engage with people affected by them, so it is an easy scapegoat. Part of this passage is correct, and I’ve specifically pointed out that the tax code is mind-numbingly complex and that politicians deserve an overwhelming share of the blame for this sorry state of affairs. That being said, the IRS goes beyond the law to make the system worse, as we saw when it imposed a regulation that put foreign tax law above American tax law. And when it arbitrarily rewrote the Obamacare legislation to enable additional subsidies. In other words, it deserves to be scapegoated. But there’s a bigger issue, one that Stromberg never even addresses. Why should we give more money to a bureaucracy that manages to find plenty of resources to do bad things? Never forget, after all, that this is the bureaucracy that – in an odious display of bias – interfered with the electoral process by targeting the President’s opponents. And then awarded bonuses to itself for this corrupt behavior! Even more outrageous, the Washington Examiner reports today that the IRS still hasn’t cleaned up its act. A series of new revelations Wednesday and Thursday put the Internal Revenue Service back under fire for its alleged efforts to curtail…conservative nonprofits. …the Government Accountability Office uncovered evidence that holes in the tax agency’s procedure for selecting nonprofit groups to be audited could allow bias to seep into the process. …lawmakers exposed the lack of safeguards that could prevent IRS officials from going after groups with which they disagreed. Meanwhile, the conservative watchdog Judicial Watch released documents Wednesday that suggested the IRS targeted the donors of certain tax-exempt organizations. Does this sound like a bureaucracy that deserves more of our money? If you’re still not sure how to answer, consider the fact that the IRS also somehow has enough money in its budget to engage in the disgusting “asset forfeiture” racket. The Wall Street Journal recently opined on this scandal. …a pair of new horror stories show why Americans dread any interaction with the vindictive tax man. Khalid Quran owns a small business in Greenville, North Carolina. He emigrated to the U.S. in 1997, opened a convenience store near a local airport, and worked long hours to give his four children more opportunity. After nearly two decades, Mr. Quran had saved $150,000 for retirement. Then in 2014 the IRS seized his bank account because he had made withdrawals that raised red flags under “structuring” laws that require banks to report transactions of more than $10,000. Mr. Quran had made transactions below that limit. So even though Mr. Quran did nothing illegal and even though it’s legal to make deposits of less than $10,000, the IRS stole his money. Just like money was stolen from the Dehko family. Here’s the other example from the WSJ. Maryland dairy farmer Randy Sowers…had $62,936.04 seized from his bank account because of the pattern of his deposits, though the money was all legally earned. …Mr. Sowers told his story to a local newspaper…a lawyer for Mr. Sowers asked…“why he is being treated differently.” Mr. Cassella replied that the other forfeiture target “did not give an interview to the press.” So much for equal treatment under the law. Yes, you read correctly. If you have the temerity to expose the IRS’s reprehensible actions, the government will try to punish you more severely. Even though the only wrongdoing that ever happened was the IRS’s confiscation of money in the first place! Notwithstanding Mr. Stromberg’s column, the IRS is not a praiseworthy organization. And many of the bureaucrats at the agency deserve our disdain. And maybe if there are continued cuts and the current tax system actually does become unenforceable at some point, maybe politicians could be convinced to replace the corrupt internal revenue code with a simple and fair flat tax. P.S. Clueless in Washington won’t be the only remake out of DC if President Obama decides to go Hollywood after 2016. Indeed, I suspect his acting career would be more successful than mine. Support payments from unemployment insurance, disability, Medicaid, Social Security, and Medicare would be reduced by the amount of the prebate, leaving not net change in support. However, disincentives to work would be eliminated or reduced. There would be no loss of income for working other than the flat tax rate. States and charities would be free to try out different methods of support for those that need additional assistance. While I agree with you that ‘Flat’ is NOT synonymous with ‘simple’, both FLAT and SIMPLE are worthy goals. Take a look at https://davidj52.wordpress.com/2015/07/24/taxes-employment-entitlements-and-welfare-2/ and tell me if this is ‘simple’ enough to correlate with ‘better than what we have now’. A “flat” tax is not synonymous with a “simple” tax. Simple tax is good. Eliminating deductions and loopholes can produce a simple tax. After determination of taxable income, the calculation of payable tax is brain-dead easy whether the tax rate is flat or graduated. The scheme outlined in https://danieljmitchell.wordpress.com/2010/03/29/the-flat-tax-good-for-america-bad-for-washington/ seems like a good start, but let’s do away with silly ideas like a $10,000 personal exemption. A single person cannot pay for rent, food, transportation, and clothing on $10,000 per year. I suggest a $50,000 personal exemption, and a $25,000 dependent exemption. Too high? Well then adjust my figures, but $10,000 is idiotic.